"Idle hands are the devil's workshop." Though it is not found in the Bible, this famous quote has some truth in it. Paul exhorted the Thessalonians in 2 Thessalonians 3:11: "For we hear that some among you walk in idleness, not busy at work, but busybodies." Here we see that idleness is not necessarily the absence of activity, but the presence of aimless activity. Idleness is being busy at the wrong things. Idleness of mind gives space for overanalyzing: Was that exchange with my friend weird? Was she upset? Maybe she was upset at me. Maybe because I didn't text her back yesterday. Is she mad and afraid to say anything to me? Probably. I should call her and ask about it. But wait . . . am I obsessing over nothing? Will she think I'm crazy if I call to talk about it? Most days my mind is ready and active to tackle the challenge of overanalyzing any situation, whether it be my marriage, my children, recent conversations or exchanges I had with so-and-so, future plans, and more. There's never a lack of things to think about. But an idle, purposeless thought life creates a downward spiral of self-focused thoughts and fantasies about problems that aren't yet in existence. An idle mind can very often be the devil's playground. So how can we avoid being busybodies who churn out mental energy on all the wrong things and instead be purposeful thinkers for the kingdom? 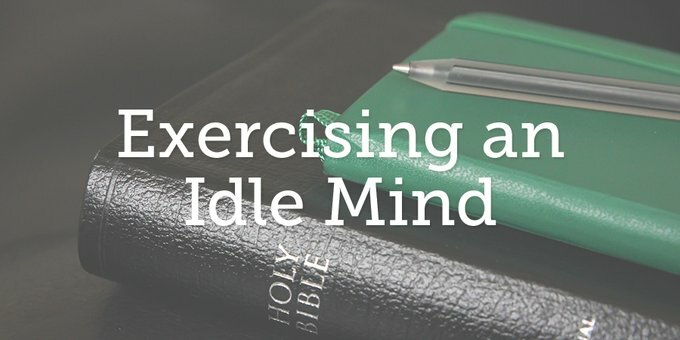 Here are three activities to prevent an idle mind. When I give my mind new fuel for meditation, it turns my thoughts to mulling over the character of God instead of the theoretical displeasure of a friend. Not only do I need a daily intake of the Word, but a varied intake. You can only mull over John 3:16 for so long, but the truth of the unfathomable love of God in the gift of His Son is portrayed in stories in the Old Testament as well as future prophecies in Revelation. The Bible is an inexhaustible well, providing new ways to enjoy God's unchanging character and ways. We need a regular and varied diet of the Word to sustain a healthy thought life. The story of Naaman in 2 Kings 5 brings new joy in my own salvation as I see in narrative form that all God asks for my soul's healing is nothing but faith in Him. Reading Nahum 1:3: "The clouds are the dust of his feet," results in a renewed worship of His greatness every time I step outside. Galatians 5:4: "You are severed from Christ, you who would be justified by the law; you have fallen away from grace," quickens repentance from attempts to be good on my own because I hate the thought of being severed from Christ. As a fire dies out for lack of new wood, so a healthy thought life dies for lack of new thoughts of God. What a plethora of fresh descriptions we find of God in His Word! But it's shameful how little of it we access. Be often in the Word and often in the books of the Bible you are unfamiliar with. The whole of Scripture is needed for a healthy thought life. Memorizing passages of the Bible is hard work! Often it feels like more energy than it's worth. But this is an exercise we cannot afford to neglect. Our minds get lazy like our bodies get lazy, and memorization is the workout we need for mental health. This chore-like activity is great training. Not only does it put God's Word one layer deeper into our hearts, it forces our minds from the passive acceptance of whatever thought presents itself through the day. Many things knock at the door of our mind, but few are worth letting in. Memorizing strengthens the muscle that locks the door when ungodly thoughts beg to be let in. Sometimes there are people and situations we cannot rid our minds of, no matter how we try. A guy you like and want to get to know. The betrayal of a friend you're struggling to forgive. The painful wait for results from that ominous medical test. How easily our minds make up storylines, motives, and future plot lines. So what can we do when our minds are dominated by such aggressive thoughts? We can pray. Prayer is an occasion to turn oppressive thoughts into something truly beneficial. Instead of making up a story about someone, we can pray for them. Instead of reviewing wrongs done to us, we can beg for a deeper understand of the cross that will enable true forgiveness. Instead of forecasting unforeseen troubles, we can share our anxiety with God and ask for His point of view. When all else fails and your thoughts seem out of control, settle into the posture of prayer, trusting that your strong God is all the strength you need. Set a guard at the door of your mind, inviting only what is beneficial. Fill your mind with thoughts of God and what He has done, and the demanding thoughts at the door will be easier to ignore. Sisters, "whatever is true, whatever is honorable, whatever is just, whatever is pure, whatever is lovely, whatever is commendable, if there is any excellence, if there is anything worthy of praise, think about these things" (Phil 4:8). In what areas do you struggle with an idle thought life? What other suggestions do you have for being a purposeful thinker for God's kingdom?